Georgia Aquarium wants to treat you and your dad to a special 2 for $60* discounted admission on Sunday, June 17, 2018. Tickets must be purchased online in advance and applies to any age group. Additional tickets may also be purchased at our discounted online, advanced ticket rate. *Cannot be combined with other discounts or offers. Offer redeemable for visits on June 17, 2018 only. Dad deserves a Zoo day! On Sunday, June 17, fathers enjoy free admission with purchase of any regularly-priced child’s or adult’s general admission ticket. Beef ‘O’ Brady’s: Dads get a free meal valued up to $10 with any purchase of $10 or more on Father’s Day. Boston Market: This homestyle restaurant is offering a great deal on a Father’s Day meal combo. Get a whole rotisserie chicken, half-rack of ribs, four sides and four pieces of cornbread for only $29.99. Bertucci’s: This Italian eatery is offering a free small handcrafted pizza when you upload a photo of your dad here. Coupons will be sent out through email on July 1. California Pizza Kitchen: This restaurant is celebrating Father’s Day with a special prix-fixe menu that includes three entrées, two small plates and one dessert for just $49.99. Click here for the full menu. Carrabba’s: This Italian grill is offering a free $10 bonus card when you buy $50 in gift cards. 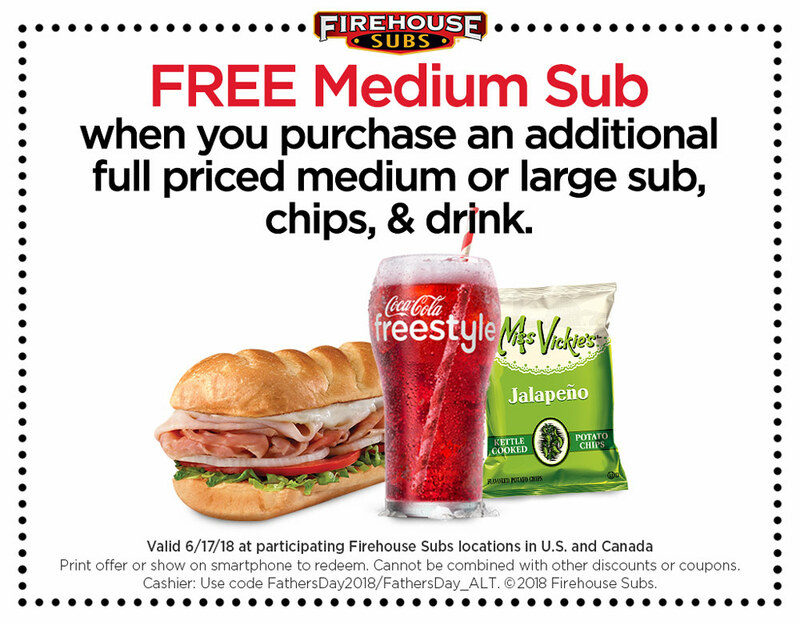 This deal is available in restaurant only through June 17, only while supplies last. Fogo de Chão: All dads who dine at this Brazilian Steakhouse on Father’s Day will get a free dining card good for one free lunch or dinner on their next visit. Hooters: If your dad loves wings, head over to Hooters to get a buy 10 wings, get 10 boneless wings free deal on Father’s Day. Mimi’s Cafe: This restaurant is offering dads a free entrée offer on their next visit when they dine in on Father’s Day. Omaha Steaks: This meat shop is offering Father’s Day specials with savings of over 50% off select steaks. PDQ: Participating PDQ locations are offering dads a free meal with the purchase of any meal, bowl, or salad on Father’s Day. Ruth’s Chris Steak House: Dads who dine at Ruth’s Chris on Father’s Day will get a $25 dining card good for any future visit. Spaghetti Warehouse: All dads eat free at this Italian restaurant on Father’s Day — no coupon required! Choose from 15-layer lasagna or any of this restaurant’s original spaghetti recipes. This deal is available for dine-in only. TCBY: Celebrate dad with a free frozen yogurt treat for Father’s Day. Texas de Brazil Steakhouse: Dads who dine in at Texas De Brazil on Father’s Day will get a free $20 dining card good for a later date. Wienerschnitzel: This restaurant is offering dads a free old-fashioned sundae on June 17. Previous post Father's Day Cake Giveaway!!! !